There’s a place in France that can only be called unique. It might not appeal to the average traveler, but rather one who seeks the unusual experience in the midst of nature. That place is La Camargue, at the bottom end of Provence, a regional park and natural reserve just south of Arles. On either side are two branches of the Rhone River. It is an international wetland, 360 square miles broad, of which one third is water or marsh. 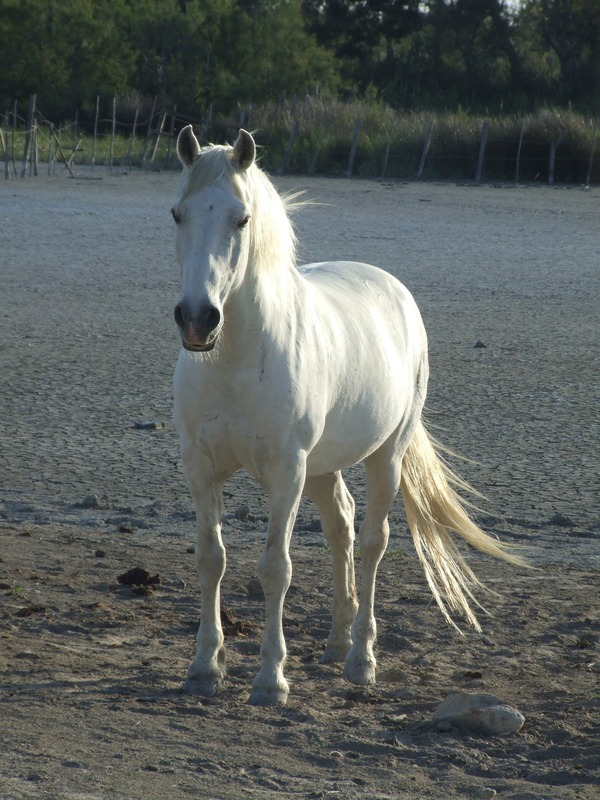 One associates La Camargue with the wild, white horses who have roamed the area for centuries. 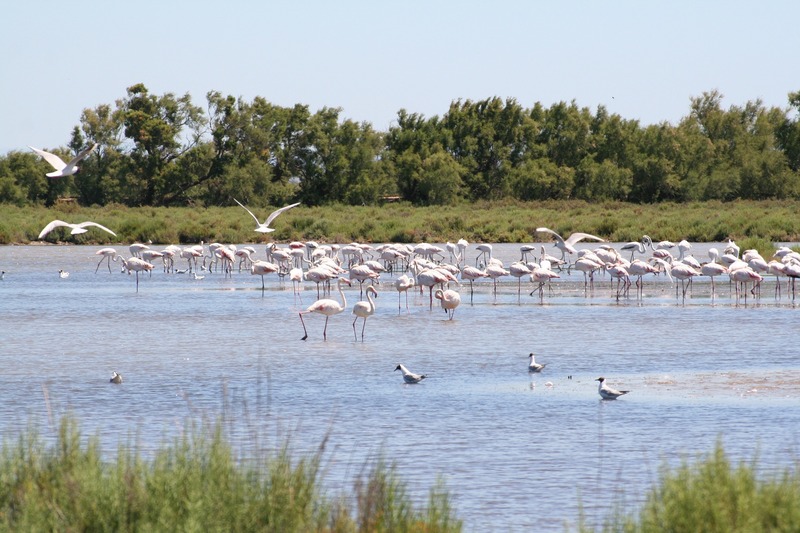 But many other animals make their homes here as well, such as 400 species of birds, including pink flamingos. There aren’t just birds, either, but black bulls and sheep as well. Many of the animals run free, but are sometimes gathered for medical treatment. Others are ridden by cowboys, called gardiens, as they herd wild black cattle. You won’t find many towns in the marshes, although to the north Arles is a large and close enough city to make a home-base. A smaller town, Saint-Marie-de-la-Mer, sits on the coast, and offers some lodging and stables. L’ Etang de Vaccarès is a large body of water, surrounded by a botanical nature reserve full of indigenous creatures. 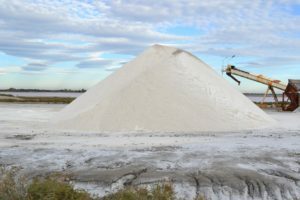 Nearby to the southeast is the town of Salin-de-Giraud, a center of salt mining. There you’ll see rows and rows of salt hills and plains, where salt has been gathered for centuries. Sounds intriguing, but is there anything to do here? There actually is! Horseback riding: You can rent horses and ponies by the hour for a slow trek through the park. 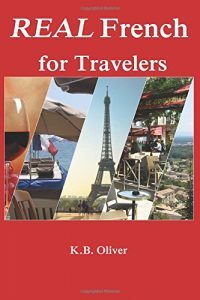 More experienced riders also have options, which you can learn about at the tourist bureaus in either Arles or Saint-Marie-de-la-Mer. Equestrian events are available as well, if you prefer to watch horses in action. Beaches to the east of Saint-Marie-de-la-Mer are less crowded than other parts of Provence, and some are remote or nearly deserted. Biking and hiking in the area. 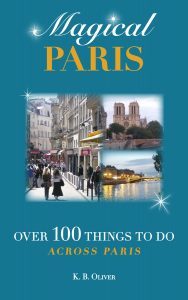 Tourist bureau will have ideas for you. 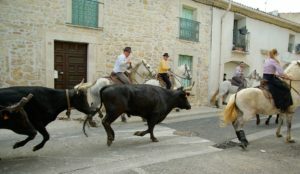 Attend a Camargue bullfight… This is a competition of skill that does not injure or kill the bull. The riders try to take a trophy from between the horns of the bull. You can find more traditional bull fights in Arles and Nimes. For a unique drive, take Route D36 south from Arles. You will drive through marshland, rice paddies (which supply 5% of the rice of all of Europe), and salt pans and hills, as you drive toward the town of Salin-de-Giraud. Take a boat ride on the Petit Rhone River from Saint-Marie-de-la-Mer. La Camargue is not far from Roman ruins in Arles, Nimes, or St. Remy-en-Provence (Glanus), Avignon, Marseilles, or the Roman arena at Nimes. The walled, medieval city of Aigues-Mortes sits on the western edge of La Camargue. This town was the stopping-off point for the Crusaders on their way to the Holy Land. It was originally a port city but due to deposits on the coast, it has moved inland about 3 miles. Sounds like a great trip! There’s a lot of nature down there to see. the group you saw might have been a gypsy band. Each year there’s a big festival of gypsies that is internationally known. Hope you are having a good summer!